Casa de las Flores, located in a high cost area of the central coast, was the culmination of a two-phased approach to correcting health, safety, and code compliance violations at a site previously operated by a neglectful owner. It now provides 43 units for families and individuals, some of whom were former homeless. Peoples’ Self Help Housing collaborated with foundations, churches, local businesses, and other supporters in the Santa Barbara County area. “Flores,” the Spanish name for flowers, is representative of the local economically critical flower growing industry, in which many of the residents are employed. The property features 3,500 square feet of common space, including a classroom and computer lab, where PSHH provides a credentialed teacher on site to administer an after school Youth Education Enhancement Program. 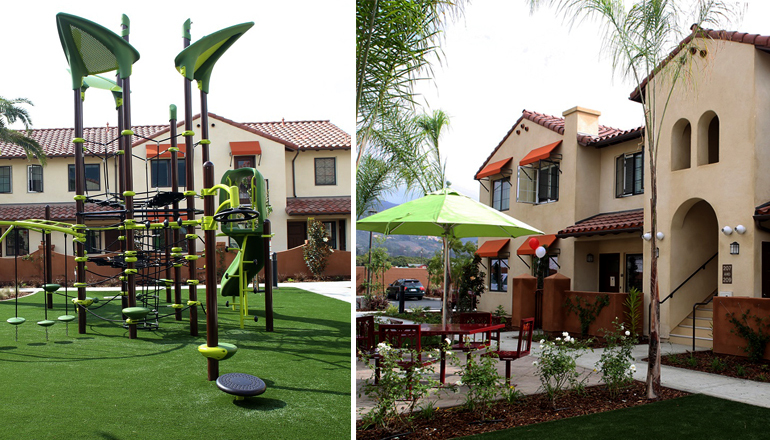 Additional onsite amenities include walking paths, a basketball court, benches, picnic tables, and a tot-lot playground.